With its uplifting floral scent, this blend is intended to calm the emotions that create insomnia, anxieties, and other emotional imbalances. Lavender 100% pure essential oil is recommended by physicians and psychologists to assist in helping with emotional difficulties that include depression, fear, insomnia, mood swings, melancholy, and stress. It balances the extremes of emotion and contributes to emotional equilibrium. Orange 100% pure essential oil balances emotions – either relaxing or stimulating as needed. It is revitalizing when lethargy sets in, calms nerves, brightens gloomy feelings, combats anxiety and insomnia, awakens creativity, inspires harmony, and promotes self-awareness. Suggested Use: This blend may used daily using any of the following methods. Place a drop under nose or onto specific points (i.e., acupressure points, trigger points, etc.) for additional therapeutic effects. Use in an aroma diffuser (just a few drops in water) for therapeutic inhalation effects. Add a few drops to a bath, vaporizer, compresses, etc. or add additional base oil for massage. 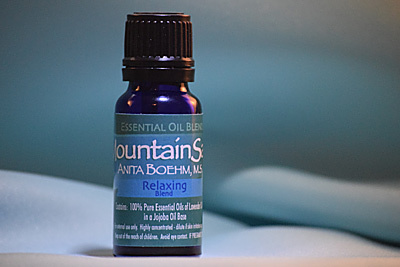 Essential oils are also great for enhancing any mindful practice including: meditation, yoga, and Qigong. Therapeutic effects of essential oils are vast and vary for each oil (i.e., emotional balancing, muscular, circulatory, respiratory, etc.). If skin irritation occurs, add more base oil (i.e., jojoba oil) or discontinue use. Avoid eye contact, swallowing, and contact to open wounds. The Relaxing blend may be used during pregnancy. There is a lot of confusion over the safety of lavender essential oil in pregnancy. That’s because lavender can be used to regulate periods. Rest assured that this does not mean using it in pregnancy raises the risk of miscarriage. However, for ease of mind, you may want to wait until your second trimester before using it. If you wish to use the Relaxing blend in the first trimester, further dilute the Relaxing blend; using about 8 drops per ounce of additional base oil.